I've never heard of shakshuka prior to walking into a small, neighbourhood eatery here in Kerrisdale (Gaia Bistro). 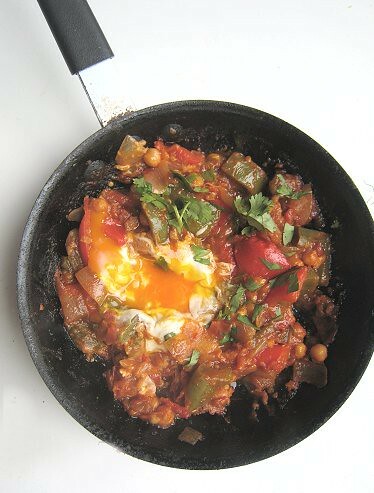 From the name, which sounded to me vaguely Africanesque and very exotic, I would never have guessed that the dish consists of tomatoes and peppers with a sunny-side up egg, with flavours so home-y and comforting belying the name. From researching the dish, I discovered that shakshuka is a popular Jewish dish eaten during Sabbath, when no cooking is to take place. It can be done in advance (the day before Sabbath) and tastes even better when it has had time to sit in a pot, to be eaten the next day. I jokingly said to TS that maybe we can take our own little vacation from cooking by cooking up a big, big pot (8 L) of it and having ourselves just heat-and-eat as we go throughout the week. To make this, I thought I'd throw in some bell peppers with some canned tomatoes and that would be that. So, I started dicing some onions and bell peppers. Then I thought that perhaps I should do a little research. 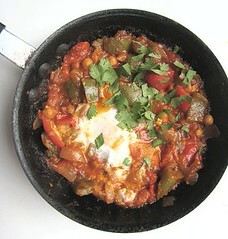 I came upon how to make "real shakshuka" on Jewlicious.com. Well, I certainly didn't have time to roast the peppers first, and cook them with tomatoes for hours. We wanted food now! So, I decided to wing it. Although there weren't supposed to be onions in shakshuka, I already diced mine, so in they went. I sautéed the onions with some garlic and chili flakes in olive oil. Then, while rooting around in the pantry, I realized we didn't have any canned tomatoes in the house. We did have fresh tomatoes, so I used that. To amp up the tomatoes, I added some tomato paste as well. 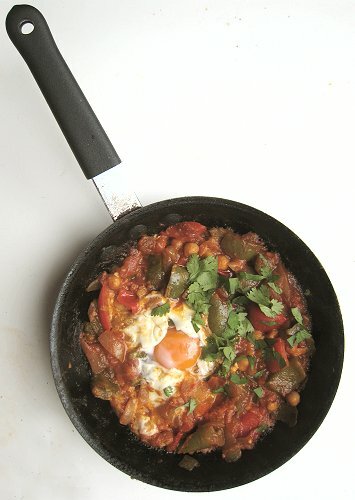 We added chickpea to our shakshuka because we wanted to add some more protein to the dish. Diced bell peppers went in next. I let the mixture cook until the bell peppers were soft. For seasonings, I added just a hint of cumin, then some sweet paprika. I adjusted the final flavors with salt and a pinch of sugar. Now the eggy part. I scooped some of the stewed pepper mixture into a smaller pan, plopped an egg in the middle of it, and waited for the egg to cook. Voilà! Look at that yolk-y goodness. The shakshuka at Gaia Bistro is served either with sausage or cheese. So feel free to add those into yours. Eaten with warm pita bread, this lunch hit the spot. It would be good breakfast and dinner too. As mentioned, we actually also ate this atop our Cuban Arroz con Salchichas. In a pot over medium heat, heat olive oil. Sauté onions, garlic and chili flakes until soft. 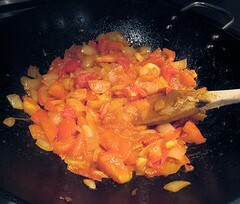 Add tomato paste and cook for about 2 minutes, until tomato paste has darkened in color. 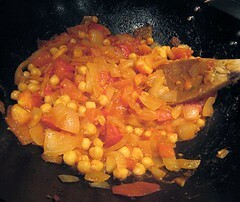 Add the chopped tomatoes and chickpeas and cook until the tomatoes have broken down. 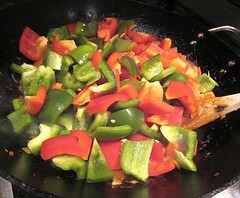 Add the diced bell peppers. Add cumin and sweet parpika into the pot as well. Bring to a boil, then cover and simmer until the peppers are soft. Adjust seasoning with salt and sugar. To serve, scoop desired amount into a small pan. Heat over medium heat. Break desired number of eggs into the pan and cook until desired egg doneness. Serve with warmed pita or other flatbread. I love all the background you've given us on this dish. Looks delicious. This would be perfect for brunch! I've never heard of this either. Sounds like a great 1 dish meal! That would make a really tasty breakfast! Me too for that yolk-y goodness! i must admit im not so familiar with african dishes neither. in france there are quite some african restaurants but i never tried them yet. this dish looks delicious! I made a version of this just last week from a Saveur recipe. It is sooooo good! Thanks for sharing this recipe. That looks like a propper meal to me. I really feel hungry! While SHAKSHUKA is DELICIOUS, the information provided by the original poster is just FALSE. 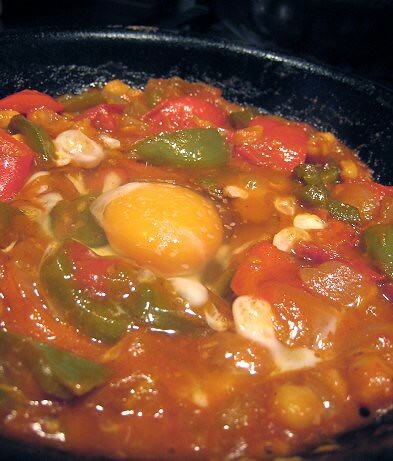 Shakshuka is a tomato stew with eggs (peppers are not the most important ingredient). A more authentic recipe for it would include more tomatoes and less peppers. Also, the "history" is ABSOLUTELY incorrect. 1. 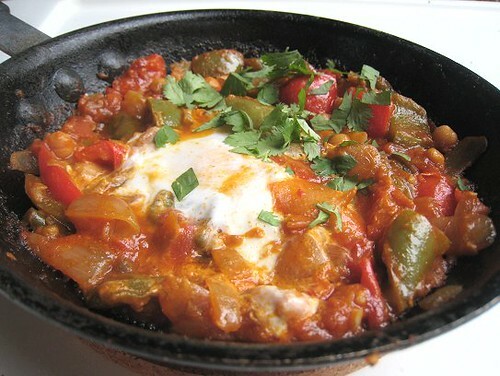 Shakshuka is NOT a "jewish food eaten on the sabbath." For observant Jews. In fact, most American Jews have never even heard of it. Also, it would be impossible to make this dish on the Sabbath, and this dish is best served fresh. 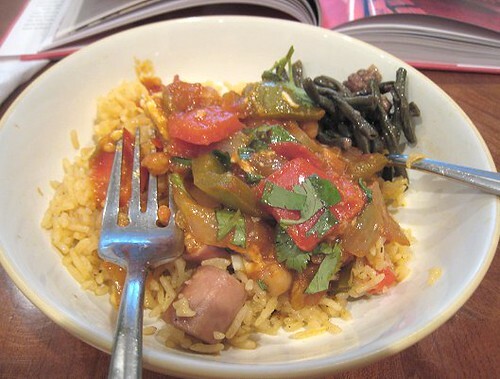 The stew many Jews eat on the Sabbath is known as "Chullent," and is VERY DIFFERENT. 2. 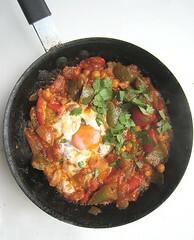 Shakshuka is a North African dish (which is very similar to the Turkish dish Menemen) that is very popular in Israel. There it is eaten casually often at breakfast or lunch. This looks delicious! I'm not particularly fond of eggs but I think this recipe could convince me otherwise :) Can't wait to give it a try! It's a great go-to dish! Thanks for the info. Any additional information is appreciated. We did discover this dish at an Israeli-owned cafe in town. 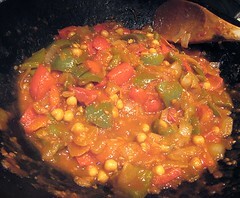 Cooking a simple meal with these flavors that I am sure will pack a punch is what I often do for my friends and family. This is a great dish the morning after a night of drinking. It will get you energized even when you have a hangover. The food looks great, but I've got news for ya. Shakshouka ain't Jewish. Letting shakshouka sit overnight to serve for the Sabbath lunch would be kind of gross. It should be eaten freshly cooked with the yolks a tad runny; this would be impossible to achieve if one were to serve it on the Sabbath. 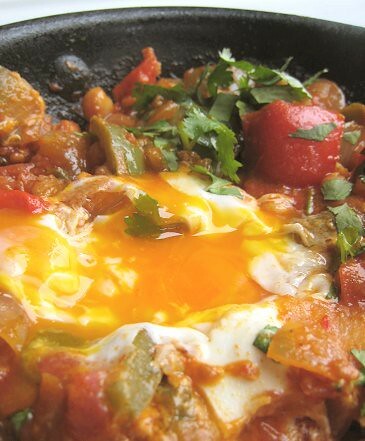 You may be confusing shakshouka with cholent (alternatively, chulent or chullent), which is a slow-cooking (from the French "chaud lent") stew often made in a slow oven or a crock pot. It is typically served after the morning prayer services of the Jewish Sabbath during "kiddouche" or at the meal immediately following this. 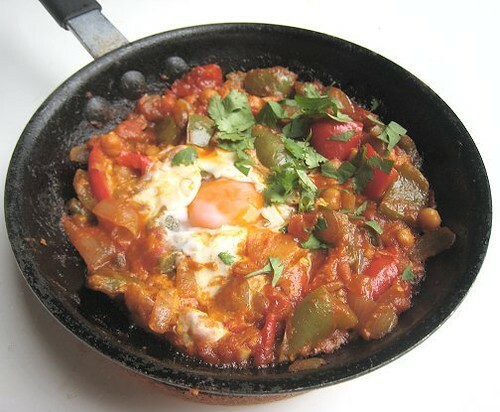 Shakshouka is EXCEEDINGLY popular in Israel as well as other Middle Eastern and North African countries, but is neither of Jewish provenance nor particularly popular among non-Israeli Jews.